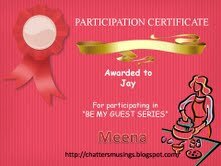 I am so pleased to have been asked to Guest Post for Meena, who is a lovely blogger and it literally means a lot to me. When she asked me If I could make a guest post for her space, I readily accepted. Her space is one of my favorites and there is always a healthy edge in her cooking and she presents it very catchy. Recipe is tasty Indian dessert “Beetroot Halwa”. Halwas are always wonderful to make and they get done so quickly. 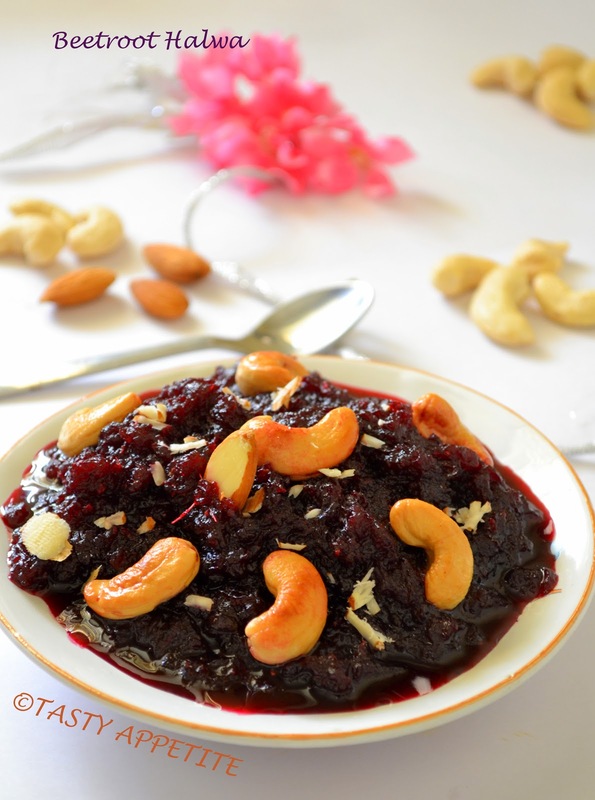 Beetroot Halwa is a delicious sweet, which is easy to prepare and tastes great. “ The way to win a man’s heart is through his stomach” is absolutely true..! Hop over here for the step by step recipe..! Once again thanks Meena for this opportunity..! 1. Wash and clean beetroot. 2. Peel off the skin and grate them to fine shreds. 3. Add ¼ cup milk and pressure cook until tender. 5. Melt ghee in a non-stick pan. 6. Keep the flame in medium and roast cashews to golden. 8. Add cooked beets and sauté well in ghee. 9. When it is done and starts thickening, add sugar and cardamom pwd. 10.Cook on high heat, sugar melts and combine along with beetroot. 11.Stir once in a while and simmer for 5 to 7 mins. 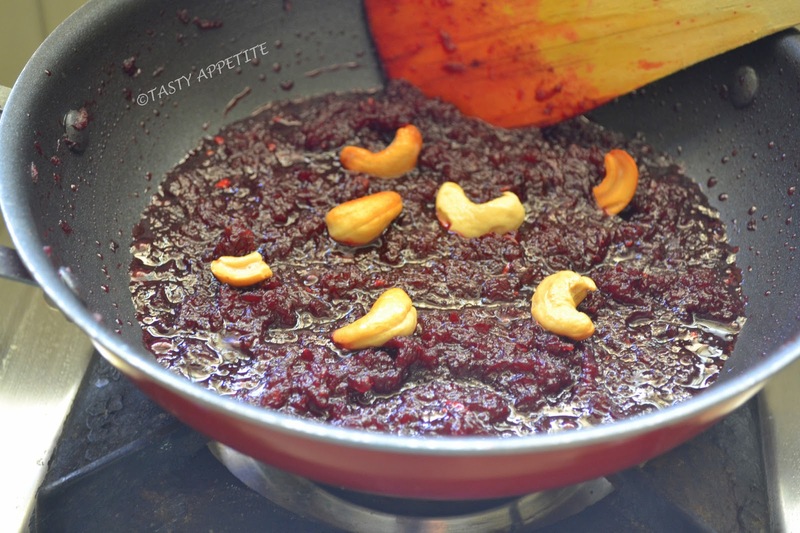 12.Once the beetroot starts leaving the sides, add ghee and stir for few more mins. 13.Finally garnish with roasted nuts. This looks delicious! 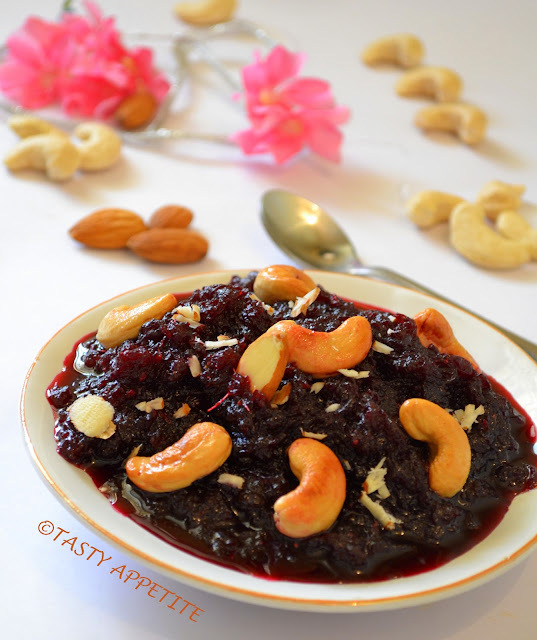 I have eaten carrot halwa but beetroot halwa is new to me! I just love that colour! Que colorido ^.^ Me gusta! Such a catchy and inviting halwa. love the color... lovely and delicious!! Ho,this is such a torture Jay,that I tried to touch the halwa from screen..Gone crazy with the color and garnish..Yummy recipe ! 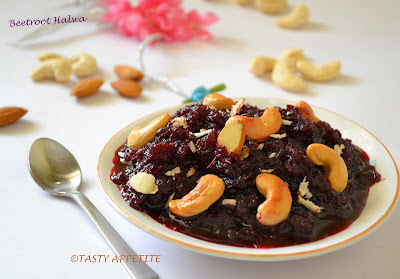 delicious and finger licking halwa. love the color of the halwa.. looks very tempting!!! Halwa looks too delicious and mouthwatering. Love this colour. Jay , your beetroot halwa sounds interesting ! The color of this dessert looks wonderful ! 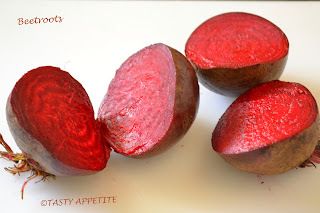 Read your post at Meena's, yumm..
Lovely color, faster to make than carrot halwa, good one. How interesting. I would have never imagined beet roots being used in a dessert. What an intriguing dessert and all the ingredients are easily obtainable. Definitely want to try this one, Jay, so will 'pin' it to keep.